You’ve worked hard to build your business—so if you’re ready to sell, make sure you protect your interests and maximize profit with The Complete Guide to Selling a Business. close the deal and transfer the business to a new owner. This edition edition is completely updated with the latest tax considerations, and now provides more advice on marketing the sale of your business. Will You Still Need to Hire Lawyers, Accountants, or Other Professionals? Do You Have a Saleable Business? Why Use a Letter of Intent? To sell your business on optimal terms, you must attend to many practical and financial details. You must, for example, determine a realistic price, prepare your business for a sale, find the right buyer, and negotiate a sales agreement. If you’ve never sold a business before, the multitude of tasks may feel a bit overwhelming. But don’t worry: Each will be explained in detail in the chapters that lie ahead. Still, it helps to have the big picture so that you can understand how the pieces fit together. This chapter will provide that big picture and give you a context for the individual steps. It’s crucial for you to learn how to build appropriate legal protections into your sale. To that end, this book will ­emphasize the legal measures you can take to protect your financial interests throughout the sales process. For example, if you sell your business on an installment basis, you’ll want to craft a sales agreement and other legal documents that reasonably assure that you’ll receive all remaining payments from the buyer and that you can take back the business if the buyer stops paying you. Likewise, you’ll want to make sure you don’t get stuck with liability for business debts that the buyer incurs. These and other key legal issues are introduced in Chapter 3. You’ll find clause-by-clause details of a sales agreement in Chapters 12 through 18 and examples of other necessary legal documents in Chapters 19 through 21. Before you go through the effort of preparing your business for sale, you’ll undoubtedly want to have a good idea of how much it’s worth. For example, in 1901, when Andrew Carnegie offered to sell his huge steel operations to J.P. Morgan, Morgan immediately asked, “How much?” Carnegie promptly picked up a napkin and wrote “$480 million” (perhaps $10 billion in today’s dollars). Morgan said yes and the sale was made. Just from talking to others in your industry or from articles you read in trade publications, you may already have a pretty good ballpark idea of what a business like yours is worth. But your seat-of-the-pants notion of your business’s value may also be wide of the mark. At the very least, you’ll want to refine it based on a convincing method that you can later use to motivate a skeptical buyer to pay your price. And, of course, there are other reasons why it’s crucial to estimate your business’s value accurately. If you set your price too high, you may be disappointed to find that potential buyers are scared off, with the result that word gets around that your enterprise is of little interest. By the same token, if you set the price too low, a savvy buyer may try to snap up your business at your bargain basement discount. And this means that unless you suddenly try to raise the price midnegotiation—something that can be tough to do—you’ll end up selling your business for less than it’s worth. Pricing a business is both an art and a science. As you’ll learn in Chapter 5, there are several methods you can use: valuing the assets, basing your price on comparable sales, calculating return on investment, or using an industry formula based on sales or units. Whatever valuation approach you employ, you’ll probably end up with a range of values rather than one absolute number. And while it’s essential to set and be able to defend a price for your business, in the last analysis, the number you name won’t be nearly as meaningful as the one a ­willing buyer agrees to pay. If you were planning to sell your car, you would probably do a number of things to make it more appealing to top-dollar buyers: tune the engine, tap out the dents, replace the worn floor mats, give the car a good wash, and wax it. You’ll want to go through an analogous process in preparing to sell your business—but the task inevitably will be more complex and prolonged. In addition to making sure the physical assets of the business are clean and attractive, you’ll need to attend to less-tangible matters, such as the financial picture you’ll present to buyers. This will typically mean taking sensible steps to reduce expenses while increasing gross and net income. 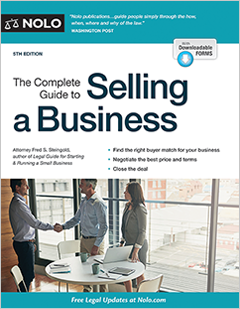 Chapter 7 provides extensive advice on preparing your business for sale, ­including how to get financial statements and other paperwork in order. You’ll also almost surely want to recast your balance sheet to legitimately present the most ­favorable profits picture. For ­example, let’s say that you’ve been taking some legitimate tax write-offs such as the cost of attending business conventions at ­attractive locations, in part because these trips have been enjoyable for you. Before you put your business up for sale, the fact that these and other similar expenses reduce your profits is fine with you, ­because they also reduce your taxes. But once you place a business-for-sale sign in the window, these same expenses can become a problem, since they make your business look less profitable than you’d wish. That’s why it usually makes sense to create an alternate balance sheet showing that eliminating the trips would yield ­significantly more profit—an important point for a buyer who initially may be more interested in staying home and pumping up the bottom line than in touring Bermuda. In addition, depending on your business, you’ll likely have a long list of other ­presale priorities. You may, for example, need to address an environmental clean-up issue, get rid of outdated inventory, or renew your lease (assuming, of course, you occupy a good location on favorable terms). These topics and more are covered in Chapter 7. Another potent sales tool—one worth thinking about creatively and developing carefully—is a business plan that looks ahead for the next three or five years. The plan you create should be a credible and convincing document that helps the buyer envision future growth and profits. But in addition to painting a rosy picture of the next several years, your plan must contain the details needed to convince a skeptical buyer that you aren’t blowing smoke. Think of your plan as a roadmap showing the buyer how to actually take your current business into new and exciting profits territory. Let’s say, for example, that you own a business that repairs and maintains swimming pools. Your business plan might describe in detail a strategy for expanding into the servicing of hot tubs and backyard spas, using the same work crew and trucks. A prospective buyer who’s keen on growth may be swept along by your vision and move quickly toward a purchase. But creating a convincing business plan isn’t only a sales tool. It can also be a huge help in convincing a buyer not to find a reason to withdraw from the transaction. Think of it this way: Since no business is sold in a day, or even a week, there will be plenty of time for a nervous buyer to develop cold feet and seek to back out of the deal. If your plan does nothing more than counter this natural tendency, it will more than pay for the time and energy you invest in creating it. Chapter 7 will give you some useful resources for putting together a solid business plan. Once you’ve priced your business, prepared it for a sale, and developed a long-term business plan, it will be time to drum up prospective buyers. That’s the focus of Chapter 8. As discussed in detail in Chapter 8, it’s possible that someone close to you—an employee, a relative, a friend, a supplier, or a customer—may be an interested and logical prospect. Or if your business is well known and popular—and especially if Lady Luck has taken a chair in a corner of your office—word that your business is for sale may be enough to bring prospective buyers to your doorstep. But finding a qualified buyer isn’t that easy for most small business owners. Chances are that to make a desirable sale, you’ll need to reach out to a bigger audience of potential buyers. This often includes putting ads in newspapers, in trade publications, and on websites that list businesses for sale. In addition, you may want to consider engaging a business broker to help locate an additional pool of potential buyers—although you will, of course, have to pay a substantial commission if you go that route. In some instances, your best strategy will be to start your sales process by broadcasting the availability of your bus­iness. The idea here is simple: The more people who know about your desire to sell, the more the word will spread (“Did you hear that Edna plans to sell the Whale Point Bed and Breakfast?”), making it more likely the news will reach a serious buyer. But don’t just assume that announcing far and wide that your business is avail­able is always the best strategy. In some instances, discretion, if not secrecy, is a better approach—especially if you fear that premature disclosure of your plans might cause key employees to defect, customers to look elsewhere, or suppliers to tighten your credit. In fact, if your situation dictates keeping your intentions mum, your main concern may be to avoid prematurely spreading word of your plans. And in a world where competitors are always watching, sometimes doing this can be harder than you might imagine. For example, let’s say you own a security firm that installs alarm systems and monitors the automated calls that come in if some­one sets off an alarm. If, after years of maintaining a stable pricing policy, you suddenly hold an aggressive sale and sub­stantially increase your advertising budget with an eye toward impressing a buyer with the fact that you’ve signed up a large number of new accounts, you may inadvertently telegraph your intention to sell. A prospective buyer may express interest in your business, but rarely will you be able to emulate Andrew Carnegie and strike a deal instantly. And even if you do come to a quick and enthusiastic hand­shake agreement, there will be plenty of chances for the deal to fall apart as the details are worked out. • Structure of the sale. Will you be selling your entire business entity (your partnership, corporation, or LLC), or just its assets? • Assets being transferred. Will you keep some assets (accounts receiv­able, for example, or a laptop computer) that are currently part of the business? • Payment terms. Will the buyer pay full cash up front (relatively rare)? If not, how big a down payment will you insist on? And what payment terms and interest rate will the buyer commit to? • Seller protection. If the seller fails to make a required payment, what legal recourse will you have to unwind the deal or recover your money from other sources? For example, will you receive a security interest in the buyer’s house as well as an interest in the business’s assets? • Seller warranties. What, if any, warranties will you make about the condition of the business or its assets? For example, are you willing to guarantee that no environmental hazards lurk within the business premises and, if they do, are you prepared to pay the cost of the clean-up? • Buyer warranties. In addition to providing security in case of nonpay­ment, what, if any, other warranties will the buyer make? For example, until you’ve been paid off, will the buyer agree to keep the business equipment in good shape, maintain the inventory at presale levels, and continue to operate from the current location? • Liabilities. How will you and the buyer handle current business debts? Will responsibility for some current debts and threatened lawsuits be transferred to the buyer? Or will you agree to stay liable for all presale obligations? And on the other side of the coin, will you be adequately protected from future debts and lawsuits? • Ongoing connection to the business. Will you and the buyer agree that you’ll perform future services for the business? If so, for how long, and how will you be compensated? • Ability to compete. Will you be able to immediately invest in, own, or work for a similar business? If you’ll be restricted, how confining and long-term will the restrictions be? Later chapters provide the information and forms you need to negotiate the deal. Chapter 3 provides an overview of the legal issues. Chapters 9 (“Structuring the Sale”), 10 (“The Investigation Stage”), and 11 (“Drafting a Letter of Intent”) will help you work toward a sales agreement. The chief legal document used in the sale of your business is called a sales agreement. This legal contract captures the details of the sale, spelling out your rights and obligations and those of the buyer in plain, easy-to-understand language. If it’s drawn up thoughtfully and carefully, the sales agreement should allow you to transfer your business entity or its assets to the buyer smoothly on a specified date (called the closing). And if a dispute arises before or after the closing, the clear terms of your sales agreement will be the first place you’ll look in an effort to resolve it. Because the sales agreement is so crucial in the sale of your business, Part 3 of this book—Chapters 12 through 18—is devoted to a clause-by-clause analysis. Part 4 (Chapters 19 through 21) covers other important sales documents, including a promissory note. But before you draft and sign a sales agreement and related documents, it’s essential that you carefully read the intervening chapters so that you understand the legal and practical import of every term and are sure that nothing significant has been left out. After signing the sales agreement, there’s one more step before the business is actually transferred to the new owner. This takes place at a meeting (called the closing) at which the buyer pays you the sale price, or at least the agreed-upon down payment, and typically signs documents such as a promissory note and security agreement. In exchange, you sign stock certificates or LLC documents (if an entity sale), or a bill of sale for the business assets, plus all the necessary paperwork to turn ownership over to the buyer. The last chapter of this book (Chapter 22) provides details on the closing, including how to prepare for it and handle any last-minute problems that may occur.